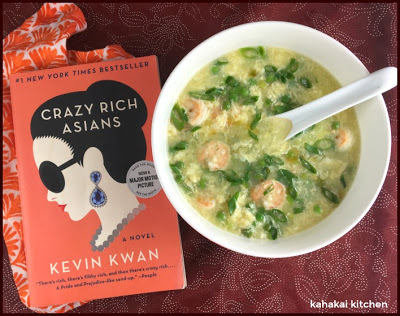 It's Roundup time again at Cook the Books Club, and we're throwing a fabulous party for our most recent selection, Crazy Rich Asians by Kevin Kwan. Plenty of food and drinks are being served up here for a truly wild and crazy feast. So, I hope you'll join in by clicking on the links, and sampling all our delicious entries. I have given just a taste of each to whet your appetites. 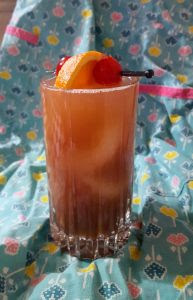 First up, right off the bat, and just in time for Chinese New Years, was Wendy of A Day in the Life on the Farm, with a Happy Hour cocktail, perfectly themed, the well known and infamous Singapore Sling! Cheers! Wendy summed it up well, saying: "Let me tell you, I loved this book. I especially loved the asides that the author put in when describing a word or expression or saying. This book made me laugh out loud. I loved those characters I was supposed to love and despised those characters who I was meant to despise. It is not a deep read by any means. It is a fun, light-hearted look at the culture of the "old" rich vs the "new" rich in China and the extravagances that they enjoy. It is a love story, that predictably has a happy ending when the "good" guys go off to a rooftop garden in search of a Singapore Sling." 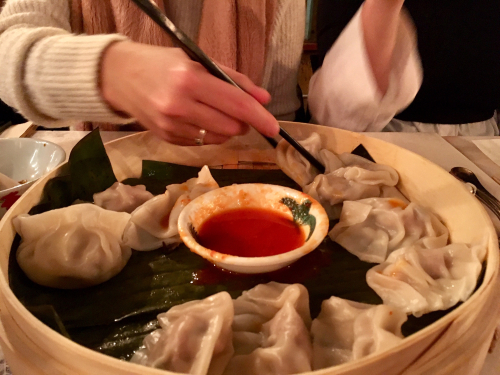 Next in was Amy of Amy's Cooking Adventures, bringing us some very tempting Ginger Pork Pot Stickers with Homemade Wonton Wrappers. Oh, yum! She had this to say:: "While I enjoyed the movie, in a train-wrecky kind of way, as this librarian typically says – the book was better!...While the movie was like being unable to pry my eye away from a train wreck, the book (with all its explanatory footnotes) made me pause and say, “Wait. 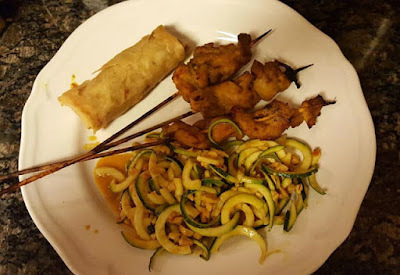 Is this for real?” According to a brief google search, yes, the story of Singapore high society (book and movie) is fairly accurate…yikes…"
Almost simultaneously, Camilla of Culinary Adventures with Camilla, arrived with Laksa Noodle Soup, for the celebration, which she said was: "Inspired by the Crazy Rich Asian passage about laksa. 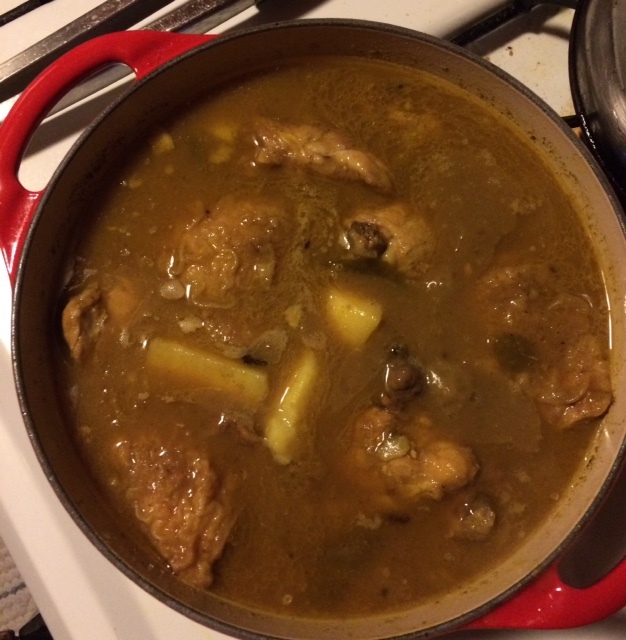 I decided to make some for dinner. I've made laksa before - with roasted pumpkin and acorn squash - and it's such a warming, comforting bowl. I wanted to try my hand at a composition with shrimp, fish cake, tofu, and hardboiled egg halves." Camilla says she actually preferred the movie, commenting: "I rarely prefer a movie version to a book. But that was definitely the case with Crazy Rich Asians. 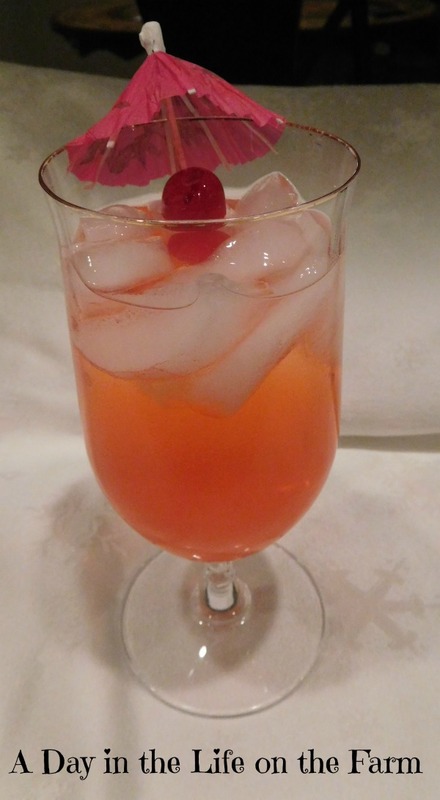 Then Debra of Eliot's Eats jumped in with her double feature - movie and book, celebrating both with a Mock Singapore Sling, for those of you who want to skip the alcohol while enjoying this tasty traditional drink. She said: "I’m glad I watched the film before I read the book. There’s a surplus of aunties and cousins and I’m not sure I could have kept them all straight without some visual references from the movie. Although I was intrigued by some of the characters (mainly Astrid), I found the footnotes to be the most hilarious parts of the novel. I will pick up the other two books in the trilogy (mentioned above) just because I want to see how things work out. Next along, bringing a tasty Singapore treat, Chicken Satay with a Spicy Peanut Sauce, was Lynda of Reviews, Chews & How To's. Lynda said: "I enjoyed the book a lot and whipped my way through the entire trilogy shortly before the movie came out. The intrigues and drama are the sort that clearly matter a lot to the characters involved, and for the most part were so far removed from my own life that the whole thing was just fun escapism." 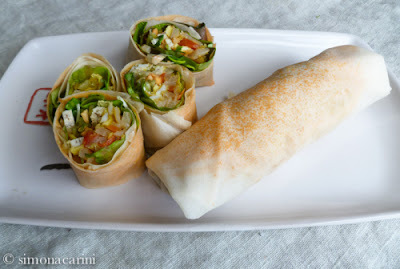 Simona of Bricole brought us some lovely Popiah - Vegetarian Spring Rolls with Jicama, inspired by a scene she read about that didn't make it into the movie, where Rachel has a popiah-making party. Absolutely fresh and delicious looking morsels. Simona said she read the book "in just a few days. It was a modern version of a Victorian novel set mostly in Asia, particularly the island state of Singapore." And that, "The intensity of feelings reminded me of food discussions in Italy: food is at the heart of our identity. That is one reason why I approach preparing a dish from a different tradition with as much respect as I can, not only as a set of ingredients prepared in a certain way, but also as the celebration of a culture. 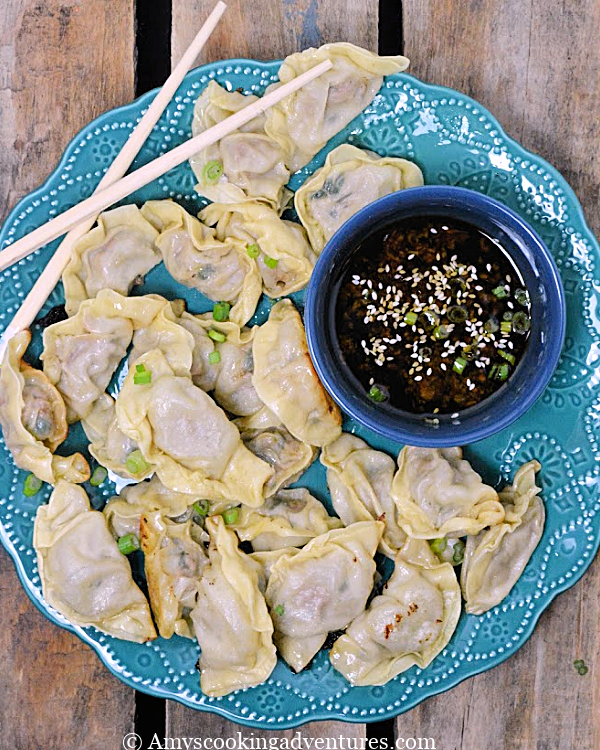 From Cathy of Delaware Girl Eats we have some delectable Pan Fried Pork Dumplings, which were part of a restaurant theme dinner she attended, given to feature foods from the book and movie. Everyone got to try making dumplings. What a treat! Cathy commented that,: "While the book is wildly popular, I'm not one of those fans, feeling that it's just too over-the-top. 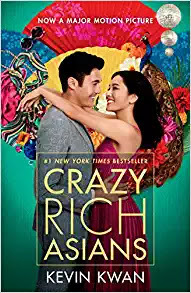 However others tell me they feel that in chronicling the lives of outrageously rich Asians, he delivers a tale filled with guilty pleasures, brisk repartee and wretched excess." I, Claudia of Honey from Rock, brought a pot of spicy Malay style Chicken and Sweet Potato Stew to the party, my recipe culled from several cookbooks, Asian and Malay. I truly enjoyed Kwan's book, and found it both entertaining and fascinating. As I wrote, "The people featured in this novel are not just rich, but crazy rich. Also, some of them, plain crazy. But, happily for our purposes at CTBC, Singaporeans are food obsessed. Lots of fabulous food is eaten, discussed and argued over, very much a local pastime." However, to tell the truth, after starting in on his sequel, decided I'd had enough already and didn't finish it. And, last but certainly not least, Deb, my fellow Hawaiian co-host, arrived with some comforting, tasty Chinese Egg Drop Soup. Just the thing to settle our stomachs after all the party food and drink. She says she did enjoy the book, but "but the fun and vibrant film won me over more. the movie streamlined the many family members and plot lines and was easier to digest and you could see all of the food and clothes and wealthy excess rather than read about it. On the other hand, the film does cut a lot out and I appreciated Kevin Kwan's detailed footnotes about the slang, descriptions of the dishes, etc. As we say in Hawaii, Aloha and A Hui Ho, thanks for contributing and coming to the party! Now it's over to our next host, Debra of Eliot's Eats, and the April-May Cook the Books Club Selection, Buttermilk Graffiti. Enjoy your reading! Nice selection of dishes. Thank you Claudia for hosting and for the roundup. We've got everything this round! Apps, main courses, beverages...eat, drink, and be merry! Thanks for hosting, Claudia! Should be posting up next announcement soon.